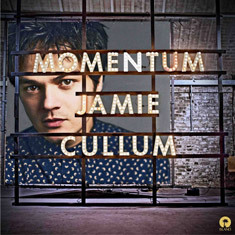 Can you believe Jamie Cullum's album Momentum has been out for over eight months already? After all the excitement of the album release and the UK tour at the end of last year, I've purposely not listened to it right through for a while as I wanted to come back to it with fresh ears. A good opportunity to give my brand new iPod touch a spin. (Yes, yes, I am late to the Apple party but better late than never, I can't believe I waited this long!) I love the sleek design, it feels really good to hold and is super easy to navigate. It's handy for checking emails without having to fire up the laptop. More importantly, the sound quality is superior to any other MP3 I have owned. My apple iPod touch, a bargain from Argos, comes everywhere with me now! Forget any preconceptions of Jamie Cullum that you may have. Momentum takes you on a journey that touches so much more than the jazz genre, including catchy pop anthems and the most breathtaking ballads. This record, lovingly crafted and produced, gives the listener a stunning snapshot of where Jamie is at right now with his music. My standout tracks remain the same as when I first heard the album: Save Your Soul, You're Not The Only One and When I Get Famous. In short, it's a momentuous masterpiece. Don't take my word for it, check it out!